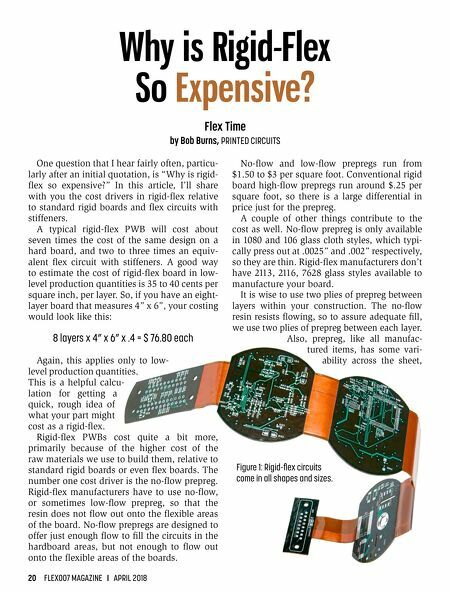 20 FLEX007 MAGAZINE I APRIL 2018 One question that I hear fairly often, particu- larly after an initial quotation, is "Why is rigid- flex so expensive?" In this article, I'll share with you the cost drivers in rigid-flex relative to standard rigid boards and flex circuits with stiffeners. A typical rigid-flex PWB will cost about seven times the cost of the same design on a hard board, and two to three times an equiv- alent flex circuit with stiffeners. A good way to estimate the cost of rigid-flex board in low- level production quantities is 35 to 40 cents per square inch, per layer. So, if you have an eight- layer board that measures 4" x 6", your costing would look like this: 8 layers x 4" x 6" x .4 = $ 76.80 each Again, this applies only to low- level production quantities. This is a helpful calcu- lation for getting a quick, rough idea of what your part might cost as a rigid-flex. Rigid-flex PWBs cost quite a bit more, primarily because of the higher cost of the raw materials we use to build them, relative to standard rigid boards or even flex boards. The number one cost driver is the no-flow prepreg. 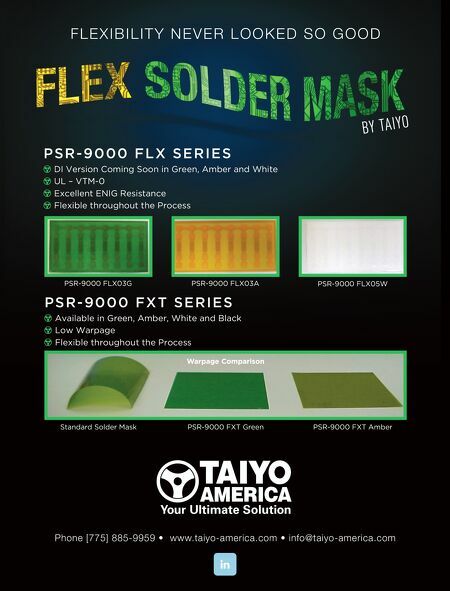 Rigid-flex manufacturers have to use no-flow, or sometimes low-flow prepreg, so that the resin does not flow out onto the flexible areas of the board. No-flow prepregs are designed to offer just enough flow to fill the circuits in the hardboard areas, but not enough to flow out onto the flexible areas of the boards. No-flow and low-flow prepregs run from $1.50 to $3 per square foot. Conventional rigid board high-flow prepregs run around $.25 per square foot, so there is a large differential in price just for the prepreg. A couple of other things contribute to the cost as well. No-flow prepreg is only available in 1080 and 106 glass cloth styles, which typi- cally press out at .0025" and .002" respectively, so they are thin. Rigid-flex manufacturers don't have 2113, 2116, 7628 glass styles available to manufacture your board. It is wise to use two plies of prepreg between layers within your construction. The no-flow resin resists flowing, so to assure adequate fill, we use two plies of prepreg between each layer. Also, prepreg, like all manufac - tured items, has some vari- ability across the sheet, Flex Time by Bob Burns, PRINTED CIRCUITS Why is Rigid-Flex So Expensive? Figure 1: Rigid-flex circuits come in all shapes and sizes. Column — RMAs: Negative Experience or Valuable Opportunity? Column — Why is Rigid-Flex So Expensive?